Father John Touloumes has served as pastor of Holy Trinity Church since August, 1993. A Pennsylvania native, he received his Bachelor of Science in Business Administration from Elizabethtown College in 1981, his Master of Divinity from Holy Cross Greek Orthodox School of Theology in 1985 and his Master of Business Administration from the University of Pittsburgh Graduate School of Business in 1986. Father John has served extensively in youth ministries on the local, Metropolis and Archdiocese levels since 1981. He was the chairman of the Seventh Annual National Young Adult League Conference (Pittsburgh, 1989). At the Archdiocesan level, Father John has served as a member of the Archdiocese Council, the National Stewardship Commission and the Archdiocese Council Technology Committee. 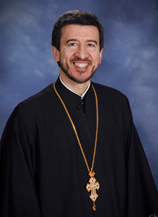 He has also served as President of the Archdiocesan Presbyters Council (2014-2018), which represents all the clergy of the Greek Orthodox Archdiocese, chaired the 2011 through 2017 APC National Clergy Retreats and held seats on the Archdiocese Benefits Committee and the Board of Hellenic College Holy Cross. In the local Metropolis of Pittsburgh, he is a member of the Metropolis Council, where he chaired the Administration Committee, led Parish Leadership development seminars and Stewardship seminars. He has also served on the Metropolis Youth Commission and Metropolis of Pittsburgh St. John Chrysostom Clergy Syndesmos Executive Board. Father John has also been actively involved in Orthodox Missions, leading mission teams of teenagers and parents on home-building and service projects to Rosarito, Mexico, with Project Mexico, to the Blackfoot Indian Reservation in Browning, Montana, with YOCAMA (Young Orthodox Christian Missionary Adventues) and to Appalachia with FOCUS Appalachia. In addition to his seminary education, Father John is a graduate of the Pastoral Marriage and Family Counseling Certificate Program offered by the Antiochian House of Studies and accredited by Balamand University. He resides in Wexford, Pennsylvania, with his wife, Presvytera Becky. They have three adult children - George, Maria and Nikolas. 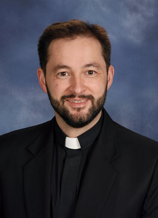 Father Radu Bordeianu has served as Assistant Priest of Holy Trinity Church since September, 2006. He was born in Piatra-Neamt, Romania and obtained his Bachelor of Divinity degree from the Faculty of Orthodox Theology within the A.I. Cuza University of Iasi, Romania in 1997. While teaching Systematic Theology and Ecumenism at the St. Basil the Great Orthodox Theological Seminary in Iasi, he also obtained his Master’s of Arts degree in Systematic Theology in 1999, from the same Faculty of Orthodox Theology in Iasi. In 2000 he graduated from Duke University with a Master’s of Theology degree and was enrolled in the Ph.D. program at Marquette University. In August 2006 he became an Assistant Professor at Duquesne University’s Theology Department, where he is now a tenured professor. He successfully defended his dissertation, “The Trinitarian Ecclesiology of Dumitru Staniloae and Its Significance for Contemporary Orthodox-Catholic Dialogue” in October, 2006, and had the degree of Ph.D. conferred upon him. Among Father Radu’s other academic credentials are published theological book reviews and papers presented to the American Academy of Religion, various lectures, workshops and media appearances on television and radio. His research interests include, but are not limited to, ecumenical ecclesiologies, the relationship between theology and the life of the Church, theology of creation, environmental issues, secularization, and social justice. He is the author of "Dumitru Staniloae: An Ecumenical Ecclesiology (Ecclesiological Investigations)". He resides in Wexford, Pennsylvanis, with his wife, Presvytera Loredana-Mihaela, and their three children - Stefan, Ana and Rebecca.